BETHESDA, MD. 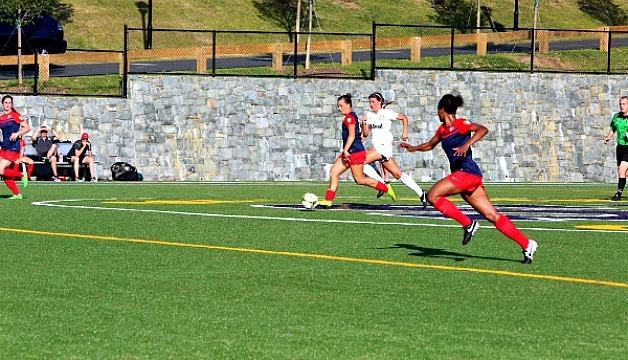 – The Washington Spirit Reserves (6-0-2) take on the Charlotte Lady Eagles (4-1-1) this Thursday July 2nd at 6:00 pm ET in their last home game at Stone Ridge School of the Sacred Heart. All games are free for fans to attend. The Washington Spirit played two games in two days against the Dayton Dutch Lions, securing two convincing victories and remaining undefeated for the 2015 season. Meggie Dougherty-Howard and Imani Dorsey provided the attacking pressure in the midfield and up top to secure the team with numerous goals and assists. This dynamic duo will need to be strong and versatile again this Thursday to secure three points. In the third game during the 2015 season, the Spirit Reserves came away with a close game beating the Lady Eagles 3-2. Spirit forward Midge Pruce provided two goals on the night to lift the Spirit for the win. The Washington Spirit delivered more attacking pressure with 21 shots on goal to the Lady Eagles 9 shots. The Spirit’s backline will need to be stronger and connect more, in order to provide their team with a strong performance and win. Lady Eagles forward Leah Fortune has had six goals in six games during the 2015 season, leading her team. Fortune’s skill and speed up top will be a deciding factor throughout the game. Goalkeeper Robyn Horner-Jones has been very strong in the last two games for the Lady Eagles. Horner-Jones has made 31 saves on the season, 21 of those saves coming from the game against the Spirit. After securing the top spot in the league, the Spirit will look to hold on to that before finishing the season with three away games.